Accepted Scientific Name: Sempervivum arachnoideum subs. tomentosum (C.B.Lehm. & Schnittsp.) Schinz & Thell. Fl. Schles. [Wimmer] 325 1923. Wimm. Origin and Habitat: Eastern Pyrenees, Southern Alps, South Tyrol, Apennines and Corsica. In Switzerland, it occurs in Graubünden, Ticino and Valais. Sempervivum arachnoideum subs. tomentosum (C.B.Lehm. & Schnittsp.) Schinz & Thell. Sempervivum tomentosum C.B.Lehm. & Schnittsp. Sempervivum bryoides C.B.Lehm. & Schnittsp. Sempervivum arachnoideum f. cristatum hort. Sempervivum arachnoideum f. fasciatum hort. Sempervivum arachnoideum var. glabrescens Willk. Sempervivum moggridgei De Smet. ex Hook.f. Fl. Schles. [Wimmer] 325 1923. Sempervivum sanguineum Jeanb. & Timb.-Lagr. Sempervivum webbianum hort. ex C.B.Lehm. & Schnittsp. Description: Sempervivum tomentosum (Woolly Houseleek) is a unusual heavily white-webbed form and one of the most ornamental species of Sempervivum. Resembles Sempervivum arachnoideum, but has larger rosettes which are strongly flattened above. Flowers, in summer; bright rose-colour. The plants are succulent and are able to grow or thrive with minimal water or rainfall, and can survive for long periods of time without any water. Habit: It is a small, evergreen perennial succulent that grow in very tight rosette forming mats up to 30 cm (or more) in diameter, often cultivated in rock gardens. 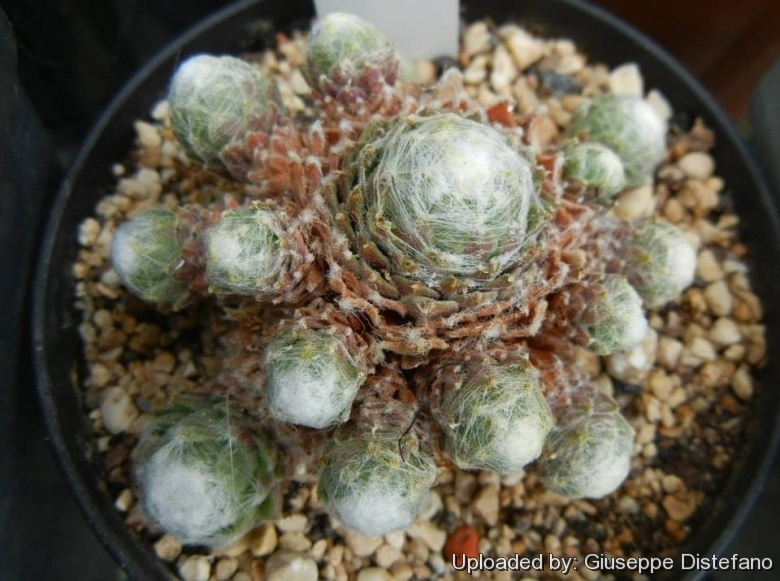 Rosettes: 1.5-3.5(-4) cm in diameter, each rosette is larger, flatter and more compact than in Sempervivum arachnoideum, and may have up to 50-60 leaves. The tips of the leaves are connected together by a very fine webbing that looks just like cobwebs. Some are very furry other slightly furry. Green with and undercolour of dark red in spring there are also types that are more red or maroon. Offsets almost stalkless crowded. Leaves: Like those of Sempervivum arachnoideum, but somewhat shorter, more obovate-cuneato, furnished with numerous white cobweb-like hairs, which are fewer in the autumn and when the plant is grown in the shade. Blooming season: Summer, lasting into early autumn. The rosette that bloomed then dies after setting seeds. Sempervivum arachnoideum f. cristatum hort. : (syn. fasciatum) a curiosity that is fasciated (crested). The fasciation is not very stable. Sempervivum arachnoideum var. glabrescens Willk. : Rosettes less than 1.5 cm across, flattish with only a small amount of cobweb. Flowers white and produced freely. Sempervivum arachnoideum subs. tomentosum (C.B.Lehm. & Schnittsp.) Schinz & Thell. : has rosettes to 4 cm across, large and flattish with a very dense cobweb and an undercolour of dark red in spring. Distribution: Eastern Pyrenees, Southern Alps, South Tyrol, Apennines and Corsica. 12) Gustav Hegi "Illustrated Flora of Central Europe." Volume IV, Part 2 A. 2nd edition. Carl Hanser Verlag, Munich, 1961-1966. 13) Manuel Werner "Houseleek species in the Alps. Sempervivum and Jovibarba" In: Avonia . Volume 28, Number 4, 2010, pp. 131-138. Cultivation and Propagation: Sempervivum arachnoideum subs. tomentosum is an interesting plant and easy to grow in container or in the rock garden. It grows well in any position where the common Houseleek (Sempervivum tectorum) may be grown. Soil: Although it grows on limestone substrata, it does not seem fussy about conditions in the garden. Require a well drained succulent soil mix. Outdoors it will spread itself through narrow locations between rockery stones. It does not prefer rich loamy soil; gritty dirt with pea gravel suits it. Watering: It takes little water & could rot if watered too often. During the growing season, the plants are watered and allowed to dry slightly before watering again. Although they can take a great deal of drought, they seem to do better with regular (but moderated) watering. During the winter months, plants are watered very little. Exposition: It need full sun to light shade and tolerates shade, but a sunny spot is nicest, though in warmer climates it needs protection from too much sun because it is not very heat tolerant. Frost Tolerance: Hardy at least to -12°C (or less). Remarks: After the plant blooms and sets seed it will die, but there will be many offsets to take its place. Uses: It is choicest species for the rock-garden and borders, it can be used for edgings, lines and panels in the flower garden, and naturalized on walls, ruins, or any position where the Common Houseleek thrives. Propagation: Is very easily propagated by division of larger clumps or by offsets.